Reinigeadal, sometimes referred to in Anglicised form as Rhenigidale, is a tiny settlement on the west side of the mouth of Loch Seaforth. Behind it rises the 528m high fin of grey rock known as Todun. 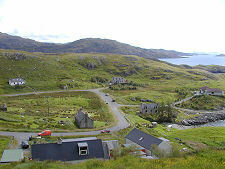 In earlier times Reinigeadal was best known as a village inaccessible except by boat or on foot. 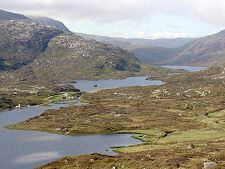 The usual approach was along a footpath that leaves the road from Tarbert to Scalpay on the east side of the outflow from Lochan Lagasdail. This crosses a col at 250m before descending to the shore of Loch Trolamaraig, which it skirts to Reinigeadal. The total walk from the road is a little over 3 miles. 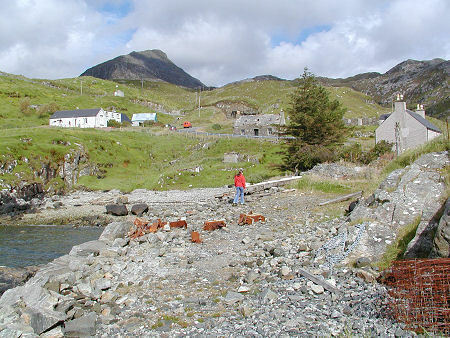 The walk to Reinigeadal remains popular, though it no longer remains the only option. 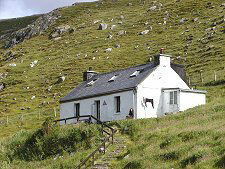 In 1989 a mountainous single track road was built linking Maraig on Loch Seaforth below the main A859 with Reinigeadal. In places this is alpine in character: and was clearly only built with the assistance of large quantities of explosives. You have to admire the determination that led to the building of such an obviously expensive stretch of road to provide a permanent link to such a very small community. For more information about Scotland's single track roads and how to drive them, visit our feature page on driving single track roads. 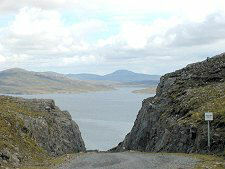 Possibly the best part of the road to Reinigeadal is the descent towards the settlement. 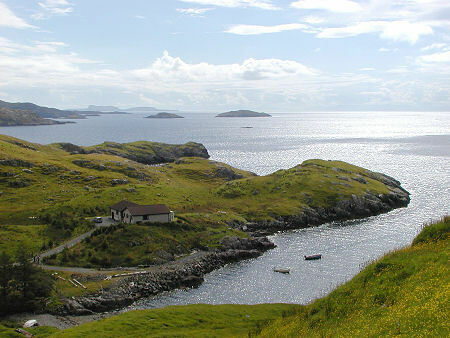 The views take in parts of Harris's wild and lonely eastern coastline, but most strikingly extend to the distinctively profiled Shiant Islands. 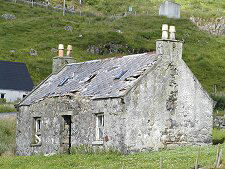 These have not been permanently inhabited since 1910 and are said to be the home of the Blue Men of the Minch. These storm kelpies are believed to chase boats and drown any sailor who cannot correctly answer a question posed by them: in Gaelic rhyming couplets. Reinigeadal itself had a population of 11 at the time the road was built. 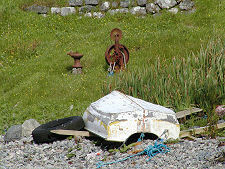 It comprises a few mostly white harled cottages scattered above and around a narrow inlet in which boats are moored. 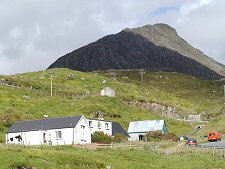 On the eastern side of the valley is the white single story building now used as the Reinigeadal Crofters Hostel. Having reached Reinigeadal it is possible to walk down to the informally constructed harbour, or simply enjoy the atmosphere of this quiet and attractive place.